Once you’ve seen enough scary things, you don’t get scared anymore. That’s one of the perks of being an adventurer,” pipes the blue haired protagonist of Netflix’s newest cartoon series, “Hilda”. As a fan of Cartoon Network’s “Steven Universe” and Disney’s “Gravity Falls,” I’m always on the hunt for more fantisful cartoons. I recently started watching “Hilda” to escape the stresses of academics and I find the show as calming as cuddling up in a blanket with a warm cup of tea at night. The themes of bravery, selflessness and originality present themselves in each episode without forcing moral concepts down the viewers’ throats. “Hilda” is based on a charming graphic novel series written by Luke Pearson. 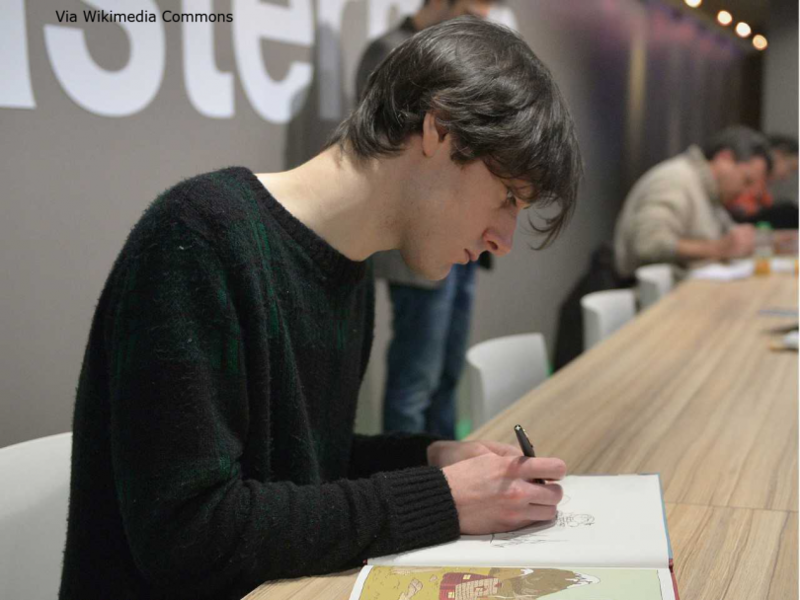 Pearson has also story boarded and written for two seasons of the hit Cartoon Network series “Adventure Time.” On his website, Luke Pearson describes himself as a cartoonist and an illustrator. I explored his website and was pleasantly surprised at the diversity of his portfolio. Besides Cartoon Network, his clients include Disney Television Animation, Nickelodeon and Penguin. The show’s animation, though simple, is irresistibly charming. The show’s color scheme reminds me of an autumnal eyeshadow palette, with a selection of warm auburn colors and cool blue greens. Trolls, thunderbirds and woffs make the show whimsical and unpredictable. For example, the trolls appear as rocks during the day and come to life at night, accompanied with glowing white eyes and a tremulous roar. The woffs are cute, puffy balls who happily hum through the sky. The elves are invisible unless humans sign a considerable amount of the proper paperwork. All of the creatures add to the fantastical elements of the series and help transport the viewer into another realm. When the show begins, Hilda lives in the wilderness with her single mother, Johanna. Hilda’s world takes place in 1900s Scandinavia, complete with snowy mountains and trolls. Hilda befriends almost every creature she encounters, including a talking thunderbird and a tiny elf named Alfur. My favorite creature featured on the show is Hilda’s pet, a loyal deerfox named Twig. Twig and Hilda’s relationship reminds me of Aladdin and Abu from Disney’s “Aladdin”, Aang and Momo from Nickelodeon’s “Avatar the Last Airbender” or a family-friendly version of Jon Snow and Ghost from “Game of Thrones.” Hilda seems content living with Johanna and Twig, but I can’t help but wonder about the whereabouts of Hilda’s father. I am unsure if the narrative will address her father’s absence in the coming episodes, but so far his absence is not noted or felt in the show. One of my favorite parts of show is how Johanna’s character is depicted. Instead of Johanna simply being inserted for the sake of fulfilling the guardian role, the show makes her into a character of her own. Johanna is sweet and supportive of her daughter while still attempting to establish a satisfactory lifestyle for the two of them. For example, the show highlights several moments where Johanna worries about Hilda making other friends her own age. Johanna undergoes moderate character development in the first season, in part spurred by her daughter’s adventures. Hilda, Twig and Johanna move to the city of Trollberg when their house gets crushed by a giant’s foot. Trollberg itself is a peaceful place to live with a rich history of trolls, as is evidenced by the huge wall which encircles the city. At school, Hilda meets the timid David and the intelligent Frida, two Sparrow Scouts who quickly get entangled in Hida’s adventures. The three kids quickly become the Scandinavian equivalent of Harry Potter, Hermione Granger and Ron Weasley. As someone who always appreciates strong female characters, I recognize the significance of Frida and Hilda being depicted as strong and independent leaders. My favorite episode occurs in Chapter 6 and is called The Nightmare Spirit. The Nightmare Spirit features a creature called marra, who is a demon who lives in forest called Huldrawood. This particular show depicts a thematic transition into darker elements without alienating younger audiences. I am halfway through the series and can’t wait to watch the next seven chapters. Thankfully, Season 2 for “Hilda” was renewed in October, 2018. Jean Kenworthy, an English major, stated, “Hilda fills the Gravity-Falls-shaped-hole in my heart,” and I couldn’t agree more.